Our Hack Weeks are about three things: pushing the boundaries of what marketing and customer engagement technology can be; learning new things; and having fun. In 2018, our Hack ‘Week’ was four days long. That’s four days for planning, designing, engineering, and demonstrating. It encompassed 16 teams – widely formed of people who don’t typically work together. Here are the hacks that stood out the most. The Best Hack award, as voted for live by the audience, went to ‘The Continuum of Automation’. The team was formed of software engineers James Marais, Luke van Blerk, and Terry Muyambo from our Cape Town office, and designer Sani Chan based in London. They asked the questions: What happens when automation goes wrong? 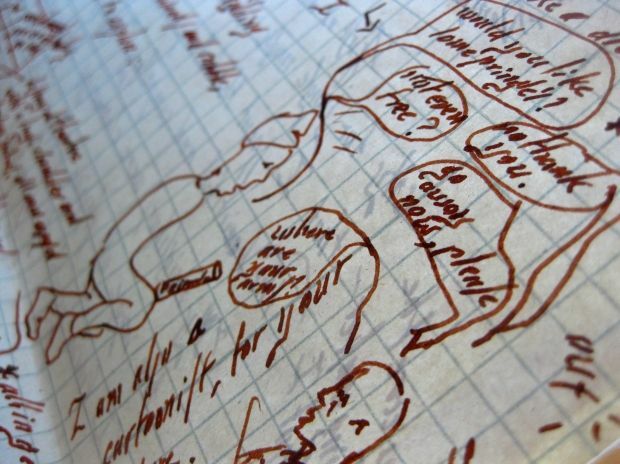 How could we give insight into what automations did in the past? Their answer was a history button that served up every version of an automation program, with a graphical representation of what it looked like at the time. What’s more, they offered a fully interactive preview for each version. They showed how you could see the historical configuration of every node from the past. Program testing can be challenging, especially when programs grow in size and complexity. This hack captured the imagination of an audience that had done their fair share of program debugging. Our founder and original CTO, Simon Bird, is a frequent member of the Hack Week audience, so this year we gave him his own award. He judged based on innovation, the approach of solving a real-world problem, and potential customer impact. Winning the Founder’s Award was ‘Contact Personas’. The winning team was formed of data scientist Sam Crawley and software engineers Grant Lodge and Joseph Appleyard. The team built a way of ‘contact clustering’ – automatically separating contacts into groups based on what content they’re opening, what they’re buying, how often they’re ordering, and so on. They did this by ranking every contact based on the percentile they were in for each metric being recorded (‘percentile ranking’). Those contacts were then clustered using vectors based on the percentile ranks. If I’ve lost you at this point, then no need to worry. Essentially, they used the data we hold on contacts to add them into common groups. The team did this so that marketers could have a different way of looking at their contacts – not just who they are, but what type of customer they are: splurgers, regulars, special-offer hunters, and so on, and then target them with specific, relevant messaging. If there’s one thing I know, it’s that our users rarely work alone. Marketing teams are, well, teams. We had two entries this year tackle the subject of collaboration, both of which deserve a special mention. ‘Signal R’ll The Things’, featuring Darran Jugdoyal, Dawn Swan, Jesus Sanchez, and Dave Russell, looked at collaboration in our Program Builder, and used Signal R to allow real-time updating of the program canvas. They showed a nifty demo (check out the GIF to the right) of two users logged into the same dotmailer account, showing how each user could see what the other was doing with the canvas. Team RKID (formed of Manchester-based software engineers Andrei Constantin and Tom Westwood) also put Signal R to use, but in EasyEditor. 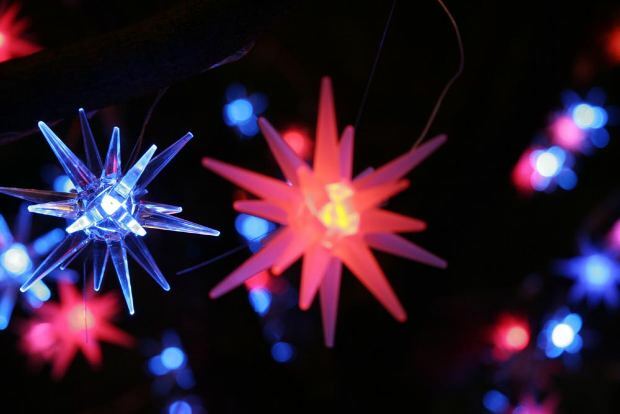 They crafted a way for more than one person to edit an email campaign simultaneously – and to see who else was viewing it. Special shout out to this team as both engineers have only been with us for a few months, and they’re already hacking the phenomenally complicated (under the bonnet!) EasyEditor. Impressive stuff. The post The winners from dotmailer Hack Week 2018 appeared first on The Marketing Automation Blog. Although our Hack Week is now in its fifth year, this was the biggest: 38 hackers, five locations, six days. The aim was to build – in the fastest way possible – something new, something left field, that could benefit marketers (or in some cases, us). Here are the top three (and my personal favourite). Our Minsk-based developer Darya Pesina hacked a mobile app that used AR to re-invent how email signups could work. Want to scan a logo to sign up? No problem. Want to see what brands are nearby and sign up to them? Go ahead. This hack was also joint winner in our CEO Award; I was in the ‘judging room’ and Milan could see how this could legitimately create new ways to incentivize signups, with localized special offers creating new subscribers. This team set out to see how images in emails could be more dynamic. They ended up with a method of streaming image content continuously, so images could look and behave differently for every recipient. 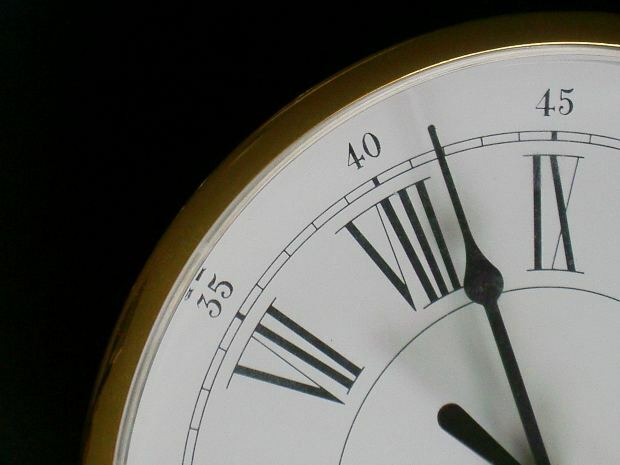 They showed a countdown timer that was always correct, no matter when the email was opened, along with a stock ticker that always used live information. But they also showed examples of loading an image of a restaurant that’s nearby, and pictures of the weather local to the recspient. Hacked by our Head of Development Andy Gretton and Development Manager Sergey Shchegrikovich, this was the second joint winner in the CEO Award. Another AR app, but this time for our users: the hack opened up new possibilities for visualizing campaign statistics. For example, it used virtual Winstons (lots of them!) to show open and click data; the pack of Winstons would begin forming two groups as a campaign was sent – one that represented openers and one non-openers. Then they would reform to create groups of clickers and non-clickers, and then show device breakdown, and so on. Worked on by Croydon-based developers Darran Jugdoyal, Joseph Appleyard, Grant Lodge and Robert Turner (with the help of a Google Pixel phone). Is it a tad narcissistic to pick a hack that prominently featured my head? Probably, but I’m not going to let that stop me. My pick goes to the team Disappointing Demoer (which was actually just our front-end developer Claire Chambers, based in Liverpool). The hack saw Claire looking at ways of making email more interactive – and what’s more interactive than a game? The result got the recipient tapping flying heads (in this case, for reasons I don’t fully understand, mine) and avoiding Floyd the dog to increase their score – all without leaving the email. In another example, a quiz was built into the email. Imagine what that could do to your engagement rates. Interested in being part of Hack Week 2018? If you fancy a bit of marketing tech hacking in 2018, there may be a place for you in the dotmailer team. We’re looking for all sorts – check out the list and apply instantly online. The post The four smartest projects from dotmailer’s Hack Week 2017 appeared first on The Marketing Automation Blog. More and more designers are turning to technology to help their brand stand out, a trend we can expect to continue into the future. From virtual reality to “coded couture”, here are five techie trends that the fashion industry is embracing. It’s no secret that virtual reality has become one of tech’s biggest trends – now it’s fashion’s turn. Samsung unveiled some of its newest fashion technology at the National Retail Federation’s BIG show in January. Through Samsung’s virtual reality headsets, users would find themselves sitting front row at their favorite brand’s runway show – no ticket required. The app “Obsess” allows you to sit front row and even interact with the show, choosing your favorite looks and getting a link to the outfit via email for a quick and easy purchase. This virtual reality shopping spree just changed the game. Rent the Runway (RTR) is making a big splash in the future of retail and tech. The once exclusively online brand just recently began opening brick-and-mortar retail locations and, with the help of Samsung’s technology, are now leading the charge in “smart stores”. RTR’s smart store, found in NYC’s flatiron district, will guide your visit based on your past interactions with the brand across all platforms (online, in-app, in store). Digital screens line the walls and interactive mirrors give you tips while you find the perfect outfit. We’ve heard Neiman Marcus has been getting tutored in the art of smart as well. Keep a look out for some helpful mirrors. Touchscreen jackets, smart purses and coded couture…oh my! If Fashion Week has shown us anything, it’s that the future of fashion is digital. Olya Petrova Jackson’s line, Ab[Screenwear], is tech friendly, featuring fashionably fuzzy touch-screen gloves. Meanwhile, Rebecca Minkoff’s newest bags provide access codes to exclusive content, aiming to make everything a part of the #BornDigital wardrobe. In other news, Google and Ivyrevel will be stealing the (fashion) show with their new digital dresses, designed for you, by data collected from an app on your smartphone. As Fashion Week in NYC continues to rage on, these are some of the techy trends that we can expect to continue throughout the season. The post 3 tech takeaways from New York Fashion Week appeared first on The Email Marketing Blog. We’re excited to announce the results of Moz’s biannual Search Engine Ranking Correlation Study and Expert Survey, a.k.a. Ranking Factors. 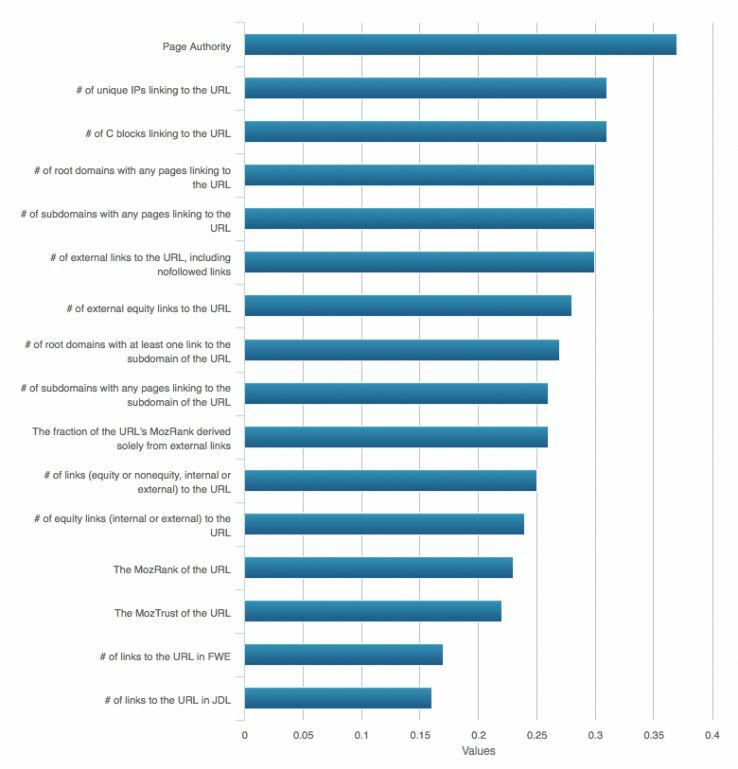 Moz’s Ranking Factors study helps identify which attributes of pages and sites have the strongest association with ranking highly in Google. The study consists of two parts: a survey of professional SEOs and a large correlation study. This year, with the help of Moz’s data scientist Dr. Matt Peters, new data partners, and over 150 search marketing professionals, we were able to study more data points than in any year past. 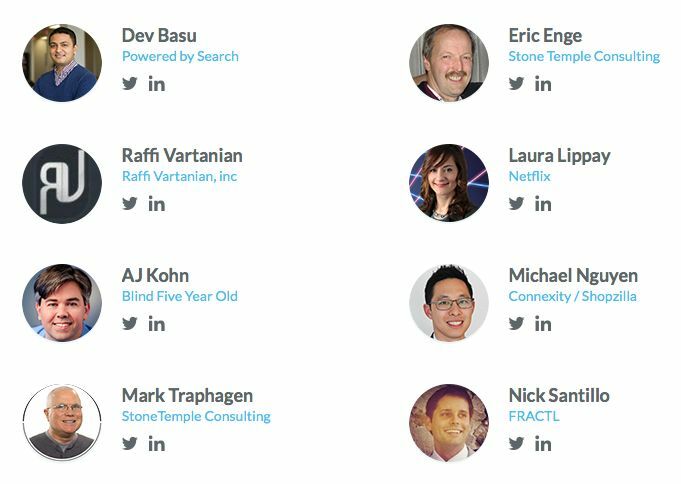 All together, we measured over 170 correlations and collected over 15,000 data points from our panel of SEO experts. We want to especially thank our data partners. SimilarWeb, Ahrefs, and DomainTools each gave us unparallelled access and their data was essential to helping make this study a success. It’s amazing and wonderful when different companies—even competitors—can come together for the advancement of knowledge. You can see all of our findings within the study now. In the coming days and weeks we’ll dive into deeper analysis as to what we can learn from these correlations. To be clear, the study doesn’t tell us if Google actually uses these attributes in its core ranking algorithm. Instead, it shows which features of pages and sites are most associated with higher rankings. It’s a fine, but important, distinction. While correlation studies can’t prove or disprove which attributes Google considers in its algorithm, it does provide valuable hints. In fact, many would argue that correlation studies are even more important than causation when working with today’s increasingly complex algorithms. For the study, Dr. Peters examined the top 50 Google results of 16,521 search queries, resulting in over 700,000 unique URLs. You can read about the full methodology here. The features in the chart below describe link metrics to the individual ranking page (such as number of links, PageRank, etc.) and their correlation to higher rankings in Google. Despite rumors to the contrary, links continue to show one of the strongest associations with higher rankings out of all the features we studied. While this doesn’t prove how Google uses links in its algorithm, this information combined with statements from Google and the observations of many professional marketers leads us to strongly believe that links remain hugely important for SEO. Link-based features were only one of the features categories we examined. The complete correlation study includes 12 different categories of data. We continue to see lower correlations between on-page keyword use and rankings. This could likely be because Google is smarter about what pages mean (through related keywords, synonyms, close variants, and entities) without relying on exact keyword phrases. We believe matching user intent is of the utmost importance. While page length, hreflang use, and total number of links all show moderate association with Google rankings, we found that using HTTPS has a very low positive correlation. This could indicate it’s the “tie-breaker” Google claims. Negatively associated factors include server response time and the total length of the URL. Despite rumors to the contrary, the data continues to show some of the highest correlations between Google rankings and the number of links to a given page. While there exists a decent correlation between exact-match domains (domains where the keyword matches the domain exactly, e.g. redwidgets.com) and rankings, this is likely due to the prominence of anchor text, keyword usage, and other signals, instead of an algorithmic bias in favor of these domains. Our study showed little relationship with the type of top-level domain (.com, .org, etc.) and rankings in Google. While not quite as strong as page-level link metrics, the overall links to a site’s root and subdomain showed a reasonably strong correlation to rankings. We believe links continue to play a prominent role in Google’s algorithm. Use of anchor text was another prominent feature of high-ranking results, with the number of unique domains linking with partial-match anchor text leading the way. Always controversial, the number of social shares a page accumulates tends to show a positive correlation with rankings. Although there is strong reason to believe Google doesn’t use social share counts directly in its algorithm, there are many secondary SEO benefits to be gained through successful social sharing. Time until domain registration expiration was moderately correlated with higher rankings, while private registration showed a small negative correlation. Engagement metrics from SimilarWeb showed that pages with lower bounce rates, higher pageviews, and better time-on-site metrics were associated with higher rankings. While correlation data can provide valuable insight into the workings of Google’s algorithm, we often learn much more by gathering the collective wisdom of search marketing experts working at the top of their game. For this reason, every two years we conduct the Ranking Factors Expert Survey. The survey itself is famously grueling–over 100 questions covering every aspect of Google’s ranking algorithm. This year, we sent the invitation-only survey to 150 industry professionals. Stay tuned for a deeper dive into the Expert Survey later this week. We’re honored to have the participation of so many knowledgeable professionals. Ranking Factors wouldn’t be possible without the contribution of dozens of very talented people, but we’d especially like to thank Dr. Matt Peters, Kevin Engle, Rand Fishkin, Casey Coates, Trevor Klein, and Kelly Cooper for their efforts, along with our data partners and all the survey participants. What ranking factors or correlations stand out to you? Leave your thoughts in the comments below. 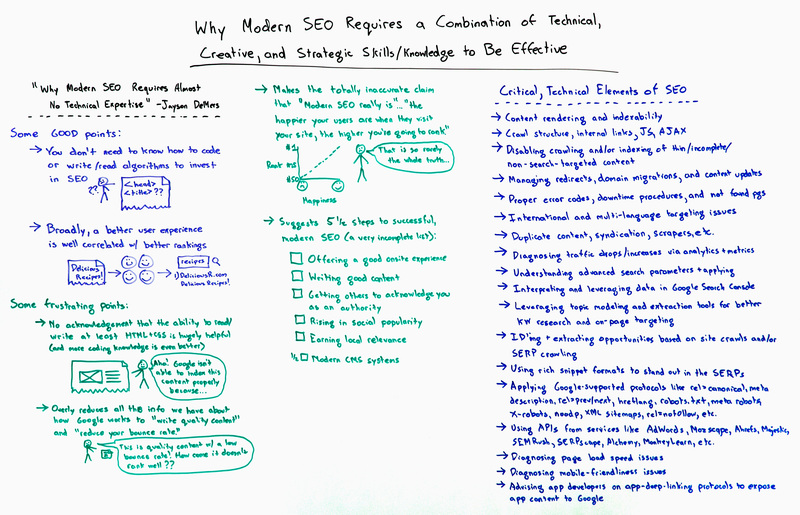 Posted in Expert SEO Consulting	| Tagged ... ..., |Add, |Adword, |Adword Keyword Tool, |GoogleAdwords, 2015, About, Access, Actually, Advancement, Agency|Company|New, AHREFs, Algorithm, algorithms, always, Amazing, Analysis, Anchor, anchor text, Announcing, Another, Area|, aspect, association, Associations, attributes, Based, Because, Believe, Below, Benefits, Better, better time, Between, Bias, Bounce, bounce rates, Can't, Categories, Causation, ccw, ccw-atrib-link, Characteristics, chart, Clear, Close, Come, coming, comments, companies, Competitors, Complete, complex algorithms, Conduct, Consulting|Search, Core, core ranking algorithm, correlation, correlation data, Correlation Study Moz, correlations, Could, Covering, Cyrus, Cyrus-Shepard, Data, data partners, data points, data scientist, Days, decent, Design|Social, Different, different categories, Dive, Doesn't, Domain, Domains, Don't, Down, dozens, each, efforts, Engagement, engagement metrics, Engine, Engine Ranking Correlation, Entities, ESSENTIAL, even, Every, Exact, Example, Exclusive, exclusive digest, Expert, Expert Survey, Expert|Seo, experts, Explained | Learn, fact, Factors, favor, feature, Features, Fishkin, Found, from, full, Game, Given, Google, Google rankings, Google results, Google's, Have, Help, Helping, Helps, Here's, High, Higher, higher rankings, hindi|Seo, Hints, hottest pieces, hreflang, HTTPS, HUNT, Importance, Important, Include, individual, individual ranking page, Industry, Information, Insight, Intent, Into, It's, Kelly, Kevin Engle, Keyword, keyword usage, Keywords, Knowledge, Later, leading, Leads, Learn, length, Level, Like, link, link metrics, Linking, Links, little, load speed, Look, Mailer, Many, Marketers, Marketing, Marketing Experts, marketing|6198318589|Best, Marketing|Automate, Marketing|Get, Marketing|Great|Increase|Business, Marketing|Search, Marketing|Web, Match, match anchor text, Matching, Matt, Mean, Means, Measured, methodology, Metrics, more, Most, Moz, Moz team, Moz's, Much, Negative, negative correlation, new data, News, number, observations, of SEO, Often, only, Over, Page, page load, page load speed, pagerank, Pages, pageviews, panel, participants, partner., Partners, parts, Past, People, Phrases, pieces, play, points, Positive, positive correlation, Possible, Private, Professional, Professional Marketers, Professionals, Prominence, Prove, Provide, queries, Questions, rad links, Rand, Rand Fishkin, Ranking, ranking algorithm, Ranking Correlation Study, ranking factors, Ranking Factors Expert, Ranking Factors Study, ranking results, rankings, rates, Read, Ready, reason, Registration, Related, relationship, Remain, response, Results, Right, Role, Root, Sample, Samuari |Search Engine, Search, search engine, Search Engine Ranking, search marketing, search queries, search results, semimonthly mailer, SEO, seo benefits, SEO experts, SEO news, SEO|6198318589|Best, SEOs, Server, share, shares, sharing, Show, shows, Sign, Signals, Site, site metrics, Sites, Small, Smarter, Social, social shares, social sharing, some, speed, stand, stay, Strong, strong correlation, Studies, Study, stuff, Subdomain, Success, Successful, Such, Summary, Survey, synonyms, Team, techniques|what, Tell, Text, Than, THANK, their, There, these, Think, thoughts, Through, tie, Time, Tips, to.What, Today, Today's, together, Total, total number, Trevor, TUTORIALS | LINK, type, Unique, unique domains, Unique URLs, until, Updating, URL, URLs, USAGE, use., User, user intent, uses, using, Very, Video|Marketing|Video, view, Views|New|Online, Want, way, Websites, Week, were, Wineries Geelong wineries|, Wisdom, Within, without, working, would, Year, years, you. 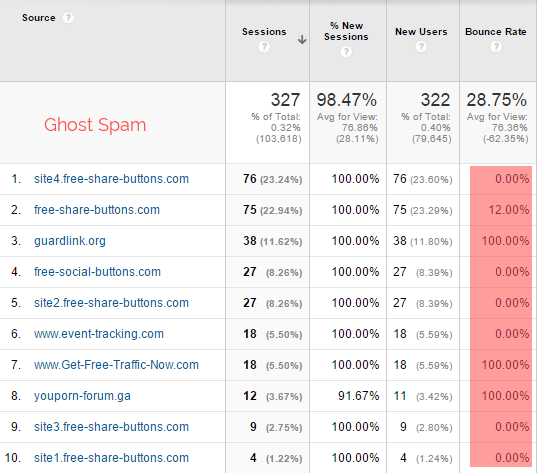 The spam in Google Analytics (GA) is becoming a serious issue. Due to a deluge of referral spam from social buttons, adult sites, and many, many other sources, people are starting to become overwhelmed by all the filters they are setting up to manage the useless data they are receiving. The good news is, there is no need to panic. In this post, I’m going to focus on the most common mistakes people make when fighting spam in GA, and explain an efficient way to prevent it. But first, let’s make sure we understand how spam works. A couple of months ago, Jared Gardner wrote an excellent article explaining what referral spam is, including its intended purpose. He also pointed out some great examples of referral spam. The spam in Google Analytics can be categorized by two types: ghosts and crawlers. The vast majority of spam is this type. They are called ghosts because they never access your site. It is important to keep this in mind, as it’s key to creating a more efficient solution for managing spam. As unusual as it sounds, this type of spam doesn’t have any interaction with your site at all. You may wonder how that is possible since one of the main purposes of GA is to track visits to our sites. 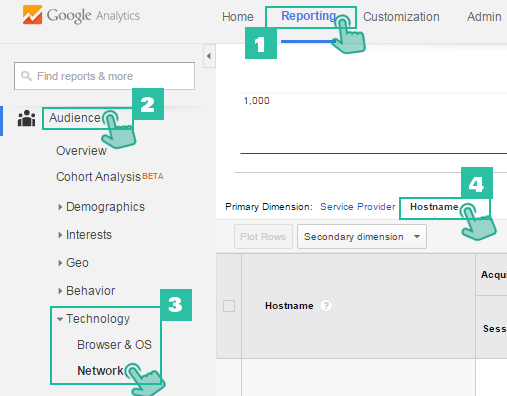 They do it by using the Measurement Protocol, which allows people to send data directly to Google Analytics’ servers. Using this method, and probably randomly generated tracking codes (UA-XXXXX-1) as well, the spammers leave a “visit” with fake data, without even knowing who they are hitting. This type of spam, the opposite to ghost spam, does access your site. As the name implies, these spam bots crawl your pages, ignoring rules like those found in robots.txt that are supposed to stop them from reading your site. When they exit your site, they leave a record on your reports that appears similar to a legitimate visit. 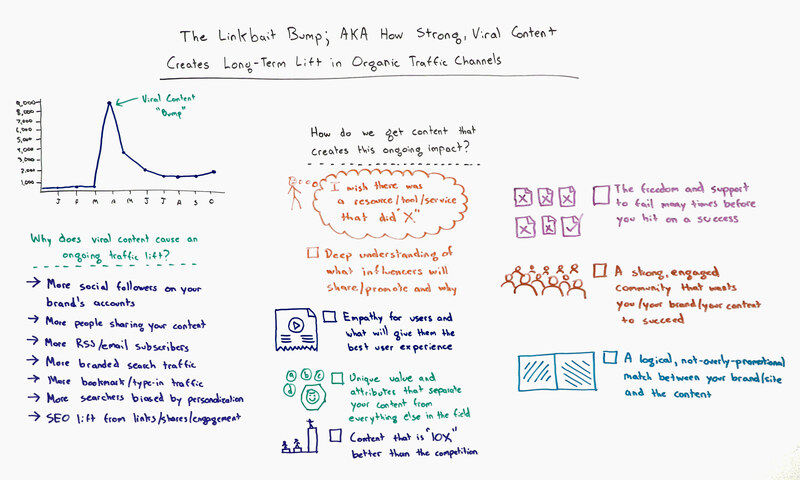 Crawlers are harder to identify because they know their targets and use real data. But it is also true that new ones seldom appear. 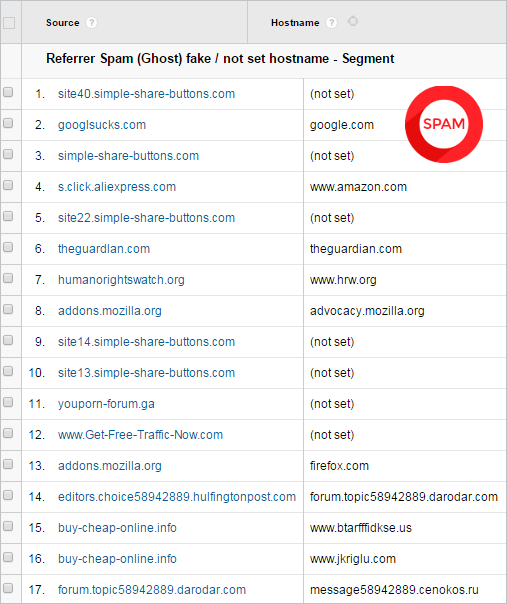 So if you detect a referral in your analytics that looks suspicious, researching it on Google or checking it against this list might help you answer the question of whether or not it is spammy. I’ve been following this issue closely for the last few months. According to the comments people have made on my articles and conversations I’ve found in discussion forums, there are primarily three mistakes people make when dealing with spam in Google Analytics. One of the biggest mistakes people make is trying to block Ghost Spam from the .htaccess file. For those who are not familiar with this file, one of its main functions is to allow/block access to your site. Now we know that ghosts never reach your site, so adding them here won’t have any effect and will only add useless lines to your .htaccess file. Ghost spam usually shows up for a few days and then disappears. As a result, sometimes people think that they successfully blocked it from here when really it’s just a coincidence of timing. Then when the spammers later return, they get worried because the solution is not working anymore, and they think the spammer somehow bypassed the barriers they set up. The truth is, the .htaccess file can only effectively block crawlers such as buttons-for-website.com and a few others since these access your site. Most of the spam can’t be blocked using this method, so there is no other option than using filters to exclude them. Another error is trying to use the referral exclusion list to stop the spam. The name may confuse you, but this list is not intended to exclude referrals in the way we want to for the spam. It has other purposes. For example, when a customer buys something, sometimes they get redirected to a third-party page for payment. After making a payment, they’re redirected back to you website, and GA records that as a new referral. It is appropriate to use referral exclusion list to prevent this from happening. If you try to use the referral exclusion list to manage spam, however, the referral part will be stripped since there is no preexisting record. As a result, a direct visit will be recorded, and you will have a bigger problem than the one you started with since. You will still have spam, and direct visits are harder to track. 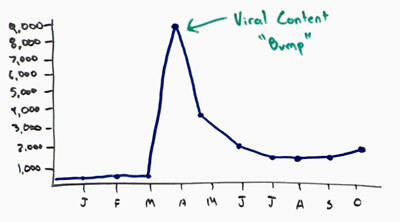 When people see that the bounce rate changes drastically because of the spam, they start worrying about the impact that it will have on their rankings in the SERPs. This is another mistake commonly made. With or without spam, Google doesn’t take into consideration Google Analytics metrics as a ranking factor. 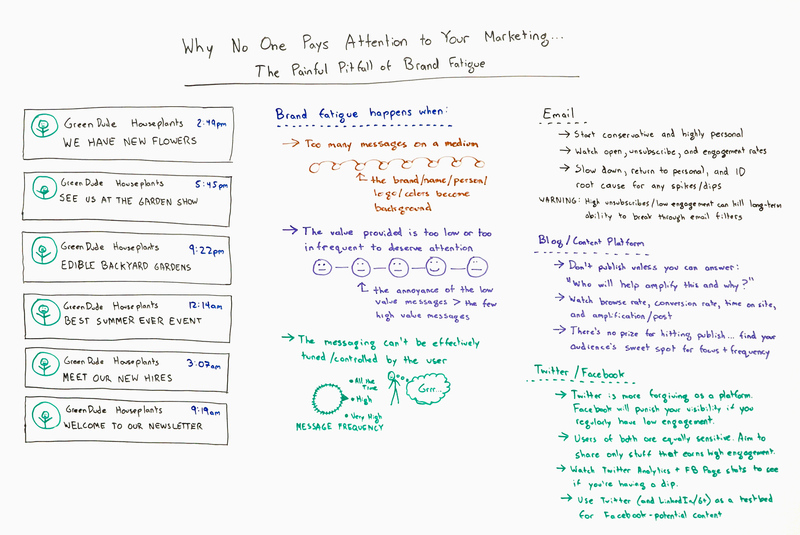 Here is an explanation about this from Matt Cutts, the former head of Google’s web spam team. And if you think about it, Cutts’ explanation makes sense; because although many people have GA, not everyone uses it. Another common concern when people see strange landing pages coming from spam on their reports is that they have been hacked. The page that the spam shows on the reports doesn’t exist, and if you try to open it, you will get a 404 page. Your site hasn’t been compromised. But you have to make sure the page doesn’t exist. Because there are cases (not spam) where some sites have a security breach and get injected with pages full of bad keywords to defame the website. What should you worry about? Now that we’ve discarded security issues and their effects on rankings, the only thing left to worry about is your data. The fake trail that the spam leaves behind pollutes your reports. It might have greater or lesser impact depending on your site traffic, but everyone is susceptible to the spam. Small and midsize sites are the most easily impacted – not only because a big part of their traffic can be spam, but also because usually these sites are self-managed and sometimes don’t have the support of an analyst or a webmaster. Big sites with a lot of traffic can also be impacted by spam, and although the impact can be insignificant, invalid traffic means inaccurate reports no matter the size of the website. As an analyst, you should be able to explain what’s going on in even in the most granular reports. Usually it is recommended to add the referral to an exclusion filter after it is spotted. Although this is useful for a quick action against the spam, it has three big disadvantages. Making filters every week for every new spam detected is tedious and time-consuming, especially if you manage many sites. Plus, by the time you apply the filter, and it starts working, you already have some affected data. Some of the spammers use direct visits along with the referrals. These direct hits won’t be stopped by the filter so even if you are excluding the referral you will sill be receiving invalid traffic, which explains why some people have seen an unusual spike in direct traffic. You can see that they use some weird names or don’t even bother to set one. Although there are some known names in the list, these can be easily added by the spammer. On the other hand, valid traffic will always use a real hostname. In most of the cases, this will be the domain. But it also can also result from paid services, translation services, or any other place where you’ve inserted GA tracking code. Based on this, we can make a filter that will include only hits that use real hostnames. This will automatically exclude all hits from ghost spam, whether it shows up as a referral, keyword, or pageview; or even as a direct visit. You don’t need to put all of your subdomains in the regular expression. The main domain will match all of them. If you don’t have a view set up without filters, create one now. Then create a Custom Filter. 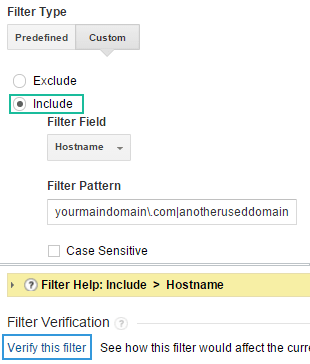 Make sure you select INCLUDE, then select “Hostname” on the filter field, and copy your expression into the Filter Pattern box. You might want to verify the filter before saving to check that everything is okay. Once you’re ready, set it to save, and apply the filter to all the views you want (except the view without filters). This single filter will get rid of future occurrences of ghost spam that use invalid hostnames, and it doesn’t require much maintenance. But it’s important that every time you add your tracking code to any service, you add it to the end of the filter. It is important to note that this file is very sensitive, and misplacing a single character it it can bring down your entire site. Therefore, make sure you create a backup copy of your .htaccess file prior to editing it. If you don’t feel comfortable messing around with your .htaccess file, you can alternatively make an expression with all the crawlers, then and add it to an exclude filter by Campaign Source. Implement these combined solutions, and you will worry much less about spam contaminating your analytics data. This will have the added benefit of freeing up more time for you to spend actually analyze your valid data. After stopping spam, you can also get clean reports from the historical data by using the same expressions in an Advance Segment to exclude all the spam. 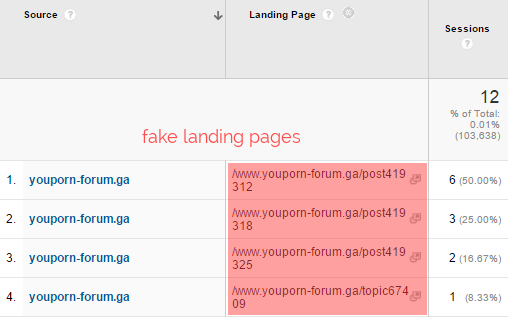 If you still need more information to help you understand and deal with the spam on your GA reports, you can read my main article on the subject here: http://www.ohow.co/what-is-referrer-spam-how-stop-it-guide/. In closing, I am eager to hear your ideas on this serious issue. Please share them in the comments below.